What is Retro Interior Design? What is Retro Living Room Design? Are you trying to capture that 60s retro look, resurrected by the AMC cable television show “Mad Men”? Well, if you like that 60s style, or any other period style for that matter, you need not totally redecorate your “pad” to duplicate that era… a few cans of paint and a top painter in Beverly Hills can do that job for you. 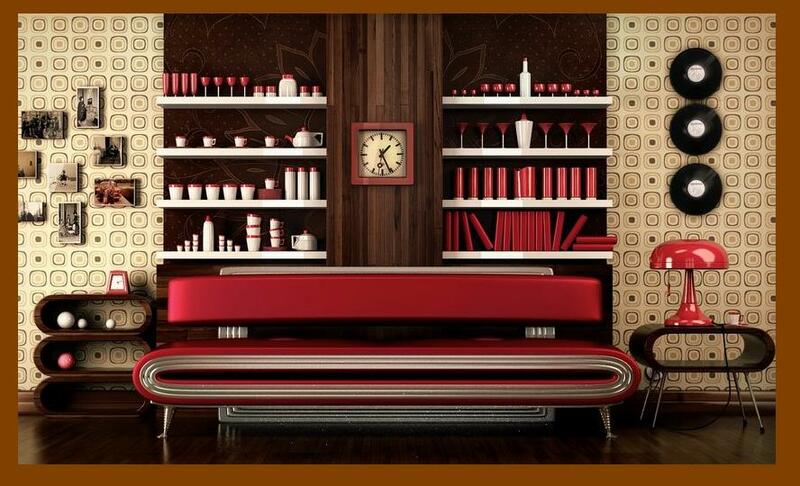 You can recreate whatever era you want with wall color or accent colors and be well on your way to a super retro look. The 40s was a decade which ran the decorating gamut from sparse, but creative, to flamboyant and ruffley. Art Deco, also referred to as “Art Modern”, was an interior design style which encompassed the 1920s through the beginning of the 1940s. During the early part of the 40s, all extravagance in design of this decade was pre-empted due to World War II. During the latter part of the war, home interior design was dominated by European artists and designers who brought a treasure trove of ideas and concepts that would have unleashed many new designs, but for the material shortages due to the war. Post-war, when production of fabric resumed, people were starting families and moving to larger homes, so it was only then that they sought out modern interior design. Subsequently, decorating trends took a radical turn. Suddenly, Early American or “Colonial” wooden furniture became popular, along with fabric featuring cabbage roses and pretty peonies which became the rage for bedspreads with matching ruffley curtains. Thus, the primary palette colors for the early 40s consisted of hues referred to as Art Deco colors, which encompassed pale or neutral shades with metallic undertones and also accent shades which were primarily exotic pastels. The period of time stretching from the 1940s to 1960, also known as the Mid-Century Moderne palette, got homeowners energized by the introduction of bold colors and deep tones. Among the most-popular interior colors were navy blue, sunny yellow, pale green and combinations such as red and white or black and white. The nifty 50s brought classic looks with black-and-white and red, and, even today, the retro diner look is prized for its classic simple yet bold and exciting colors. You might have grown up in a home that featured flowered upholstery in the living room, a sunny yellow kitchen with a chrome dinette set and chrome accessories, lots of red-and-white gingham in towels and even curtains, and the perpetual cherry motifs. There were vivid-colored ceramic accessories that sat atop plain Formica-style countertops. The look in the kitchen was “homey” because the countertops groaned with canister sets and breadboxes as well as fresh baked goodies cooling on the countertops. The kitchen was the hub of the house since families that had been torn apart from the war, continued to rejoice in having all members present once again at the dinner table. If you were a child of the 60s, you’ll remember that it was a time of change – styles, technology-wise and socially. The styles, often inspired by so-called flower children and hippies, consisted of raggedy or even extreme looks because it was an era of American culture that reflected a rebellious younger generation. That younger generation rebelled against long-standing traditions, especially with regard to fashion and music. The 60s fashion was not just about miniskirts and go-go boots, the non-traditional look was apparent and evident in home décor as well. In the tail end of the 60s it was a period of metallic looks which mirroring the disco trend. That nightclub look soon surfaced in home and office interiors. At the other end of the spectrum, the so-called beatnik look was a reflection of the young generation, a/k/a “hippies”, who traveled to the Far East and wished to embrace that ethnic look in their dress and home styles. As a result of the fashion statement so well known to the 60s, the colors prevalent in that era were inspired by nature, in tones such as gold, yellow and green, but the so-called psychedelic colors like hot pink and tangerine were very popular as well and termed “mod” (as a short form of “modern”), and could be found in everything from fashions, interior décor to even the flower power decals on the VW vans that the younger generation drove. The use of metallic colors was used abundantly, plus black and white, always a winning combo, was still very popular. As to the 60s, there has been no other period of time that a generation wished to recall old times with fond remembrances since it was an era of self-expression and what better way to do so than with your personal style as well as that of your home décor? If you’re interested in recreating the above-named eras in your home décor, be sure to see a top painter and you are assured a look that is either the cat’s meow, buzzin’, nifty or groovy, depending on the period of time that you choose. © 2018 Interior Design Questions. All Rights Reserved.